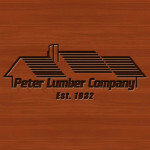 In 1932 Hugh M. Peter, Sr. founded Peter Lumber Company. His business plan was to proudly offer our customers quality materials, good service and sound advice at the right price. That is our heritage and our future. Three generations of Peter family members have worked within the company to maintain our tradition of integrity, dependability and value. We invite you to stop in, call or e-mail any of our seven locations for further information.